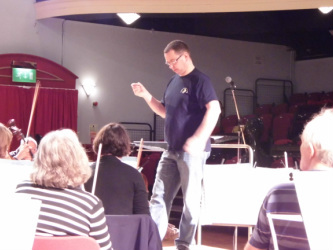 Formed in 1996 by French horn players Jacqui Blore and Matthew Ellis as the Cambrian Philharmonic Orchestra, we have been presenting high quality concerts in North East Wales for over twenty years. Without a ‘fixed’ membership or set weekly rehearsals, our players come together for only a few rehearsals before each concert. This gives us the flexibility to provide any size of orchestra to suit the repertoire we play or to fit into any venue. If you are interested in booking the orchestra, or would like to be considered to join the orchestra, please contact us through the Contact Us page. Also, if you want to read more about musicians who have worked with us in the past, or see some of our past concert programmes, please click here.